CD/CD-R/CD-RW compatible, NAD CD-6 full function remote control, Burr-Brown Sigma-Delta 20-bit digital to analogue converter, coaxial digital output, low output impedance, separate power regulators for analog and digital sections, EL backlit display with selectable track/time/repeat, repeat mode for single track or entire CD, program play up to 20 tracks, random play. This is a tough machine to get a handle on. I've read everything posted here, and others, and the reviews (mostly glowing) encouraged me to purchase the unit used for $200. The unit produces good sound - especially in comparison to other $200 players (don't pay more), and provides significant upgrades in sound quality when compared to entry level players, or re-purposed DVD players etc. Much was my story, upgrading a rag-tag bunch of consumer equipment (ie Panasonic DVD, Yamaha receiver, Athena speakers), but now that the rest of my system has evolved (AudioRefinement Pre5, VTL ST85, Quad 21 speakers with similar upgrade to cables and wires) the NAD, well, it's weaknesses are revealed and is truely, in the company of my other components, the far weakest link. The source is the starting point in the creation of the music we listen to -- weakness here cannot be compensated by anything downstream in the system. If you have a casual system, or are looking to spend $200 on a "better" player, I don't think you can do much better. In the longer term, with other investments made in decent quality components and the like, this player falls a long way short. If you are hard up for a decent source and have limited funds, go for it. If you are looking to upgrade your rig along the way, this would not be the player to benchmark your system with - spend your first money on a good source - stretch to the 700 to 1000 mark and you can get into Meridan 506 or 508 -- an infinitely better player that you can grow your system around. For about half - the Creek CD50 is available and is worth at least the upgrade in cost. To each their own - I'm not knocking the unit - and by the way, it does have issues with reading CDs reliably - if your are looking for a great sounding $200 player, look no more, but let's face it, $200 players sound like, well, $200 players. That's what makes reviewing this unit difficult -- great value for the money, but not really a great player in the long run. Have fun - tweak away! I was lucky enough to get a chance to pick one of these up after selling my beloved C515BEE. I was unsure it would sound as good with the 515 being a newer model, but I have to say the 521 sounds better. It almost sounds modded. It is used and I know little about it's past. Some talk about burn in time. Maybe this unit is really burned in well, but I am hearing things I didn't with the newer model. Wow. Better detail, and smoother. The bass is just different. It may be a little richer or slower bass, but I like it. I think the DA converter in the 521 is the Burr Brown vs. the Sigma Delta in the 515. Also, the 521 is a little deeper chassis wise which may have allowed them a better layout or a bigger power supply. All I know is it is wonderful. I now have a favorite CD player as I have been monkeying around with many for months including CAL DX2, several Sony ES models, Magnavox CDB650, and some other nice vintage pieces and this one takes the cake. Bravo NAD. Keep on making affordable pack leading equipment and keep working on the durability. Many of these could be classics if they can stand up over time. The C521bee sound great at this price with excellent build quality and sonic abilitys to shame players costing much more. I recently purchased the C521bee from my local Audio X. I got this player to replace my marantz cd player. My sstem is a marantz pm4400 amp with Mission M33i speakers, im using black rodium interconnects with black rodium ast400 bi-wire. Im Very pleased With the C521bee sounds Exciting no matter what music you play the detail is Excellent and the bass is warm with good timing. Theres plenty of warmth and Scale no matter what music you like The bass maybe Big but is well controlled. If like Me you love hifi But are on a tight budget Yo wont go far wrong with the nad. You will probably have noticed there are savings to be had if you buy online but beware it does affect your warranty with nad. I payed full price for the c521bee but my local audio X also included A black rodium interconnect worth £30 so its not always cheaper to buy online. Very disappointed! Bought this CD player brand new less than two weeks go. From the very first day I noticed that it makes occasional tiny skips when playing CDs. The issue seemed to have reslved after 1-2 days. However, after 7 days of usage, it just stopped recognizing CDs and playing all together. I still cannot believe it: one would think that they could have learnt by now how to manufacture a reliable basic CD player. Apparently, NAD has not! It doesn't matter what the sound is, if it the player doesn't last! Recently, I've tweaked this unit with blu-tack and the result is superb! Tweaked the CD mechanism and also put the tacks on top of the capacitors. The unit became more alive, soundstage magically improved!! More detailed!! I believe the good quality of the unit before tweaked is already THAAT GOOD!! great cd player. the only other "high end" cd player i've owned was a harmon kardon. and that thing sucked. this cd player is fantastic. clean, detailed sound. its beging used with a adcom gfa-6002 amp, rotel 980 pre-amp, and phase tech tatro 7.5 speakers. I bought this CD player from Richer Sounds when my old Sony player started skipping. When it plays, the sound is amazing, very clear and open, and yet with good bass and plenty of speed. The remote is well designed, and I like the fuss-free looks. Unfortunately it is unreliable. Some of my CD's do not play properly in it, mainly nasty scratching sounds but a few won't read at all. All in all I'm quite disappointed. Sony CDP303ES, Marantz CD46 & CD63SE, Nad 502, Rotel. does not color the music. Balanced accurate sound and open dynamic sound stage. A steal at this price. I bought this unit because of the reviews. my 17 year old Nakamichi cdp died a month after i hooked it up to a jolida 302b. At first i thought that i had made a mistake as the unit sounded a bit thin. Other reviewers said that it took time to open up so i played it as much as possible for week and 1/2. Once this baby burned in the sound was dynamic, balanced,good sound stage for a player of this price. I find that this player does not color the sound at all. Bad cd's will sound bad and good quality cd's will amaze you. I have this hooked up to a jolida 302b with silver serpents, svs woofer and infinity rs5 speakers. 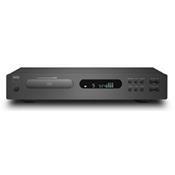 I was going to buy a jolida 100 cdp but I feel the NAD was more bang for the buck and every bit as good sonically. I don't know how this player will sound with solid state gear but I can tell you it's a great match with tube gear.